Suspense, "radio's outstanding theater of thrills", was one of the premier programs of the Golden Age of Radio, featuring a who's who of Hollywood stars spread out over its 900+ episodes. Scripts focused on suspense/thriller/mystery plots, typically involving a normal person being thrown into a bizarre or dangerous situation, with the solution withheld until the last moment--often with a surprising twist. 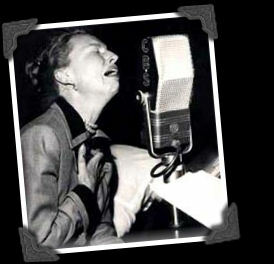 Guest stars included Cary Grant, Orson Welles, Frank Sinatra, Agnes Moorehead (pictured), Humphrey Bogart, Lucille Ball and Marlene Dietrich. The show ran from 1942 to 1962.